HealthOffice® Anywhere Nursing Services is provided as part of Healthmaster&apos;s hosted HealthOffice® Anywhere Web Services and is used throughout the school day to properly schedule, control, document, and report detailed information about every student encounter with a school nurse or other nursing healthcare provider. HealthOffice® school Electronic Health Records provides scheduling, documenting, reporting, and compliance functionality that equals or exceeds all requirements of local, state and federal guidelines in a single, easy to use program and contains all of the components every school district must have in order to be accurate, compliant, secure, accountable, and fiscally sound. Each individual user can only see those areas of the program that they have authorization to access. This provides a clean, clear interface without the confusion and clutter associated with unnecessary displays; users will not be aware of any part(s) of the program they won&apos;t be using. Demographic and contact information for each student is imported every night from the District&apos;s Student Information System (SIS) program so that the HealthOffice® database always contains the most recent information. All nursing services, medical problems, nursing assessments, interventions, outcomes, scheduled or unscheduled encounters, medication dispensing, as well as all necessary Medicaid or commercial insurance billing information are all entered and can be seen at a glance by an authorized user. Group or individual screenings and encounters, multiple types of notes, form and referral letters, health care plans, student demographics, contact information, medical alerts, detailed immunization history (including evaluation of each vaccine by dose in accordance with your state&apos;s criteria), and numerous other features provide all of the features and functionality needed by the healthcare professional to perform all of the scheduling, documentation, and reporting required by her or his job in a secure and professional manner in one integrated program. The use of district-wide or individual templates allow quick, accurate documentation of the most common encounters and related Medicaid information, usually in less than a minute. HealthOffice® Anywhere's school Electronic Health Records completely eliminate the slow and tedious process of keeping and storing multiple records by hand or in multiple programs. It allows a user not only to retrieve records and produce reports at the touch of a button, but also to secure and store all student health records in a single, secure, and comprehensive Microsoft® SQL database housed on servers located at Healthmaster&apos;s contracted, independently audited data center. Automatic, encrypted backups occur nightly. 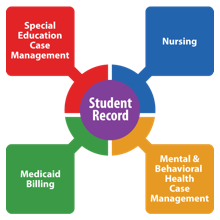 HealthOffice® school Electronic Health Records for nursing comes with extensive, integrated reporting where the most often accessed reports are available with one-click from the Dashboard, Student Record, or individual encounters without having to move to the report section. The report section provides virtually unlimited summary or detailed reporting of individual student encounters and statistical reports, along with state-specific reports that are useful for all districts. Our school electronic medical record software&apos;s reporting capability contributes to better student health outcomes, increased attendance, and more efficient administration of the district&apos;s health resources. HealthOffice® Anywhere has a confidential, secure, interactive, web-based Health Portal that allows parents or guardians authorized by the school district, to enter and submit forms or view certain health information relating to their child or children. The Health Portal is easily accessible by the parents through any web browser and from any location. This SERM software, integrated with Healthmaster&apos;s robust Advanced Reporting tool, provides unlimited custom reports and data analysis capabilities. If a data element has been documented, it can be reported on individually or in combinations with other data points, creating custom reports that are only limited by your imagination. Contact us today to learn more about our school Electronic Health Record software.